In June of 1895, the first Japanese Christian mission of the Anglican Communion in America was founded by Nippon Sei Ko Kai of Japan. The purpose of the mission was to minister to Japanese Episcopalians and to evangelize among Japanese immigrants. The first priest of the mission was the Rev. Masichi Tai, sent by Bishop John McKim of Tokyo. The first location of the mission was in a room located at 421 Powell Street in San Francisco. 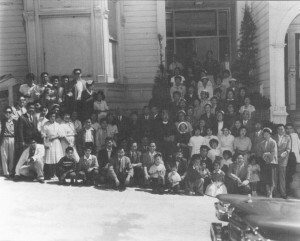 Much of the original mission was among Japanese students. For many of them, the churches were like second homes, helping them with English, finding jobs, and adapting to life in the US. Not long after the establishment of the mission by Nippon Sei Ko Kai, the Diocese of California took an active interest and in 1902 recognized it as an organized mission of the diocese. The mission was probably sponsored at one time by Trinity Episcopal Church and some years later by Grace Cathedral. Soon after its formation, the mission moved to 709 Geary Street, sharing a three-story building with Fukuin-Kai, or Japanese Gospel Society, established in 1877. It was primarily a social and educational organization for Japanese students and had already been involved in the formation of other Protestant churches. The joint-use agreement was signed by Bishop Nicholas and the Rev Tai for Sei Ko Kai. The building itself had 12 rooms to provide room and board for Japanese students, and also housed a jointly operated Japanese-English language school downstairs. The location was convenient, with a spacious garden containing trees, and a panoramic roof-top view of the City. Three or four years after its founding, the mission moved to a location on Pine Street near Taylor. In 1904 it moved to 1304 Post Street for one year, and then to 2236 Post Street. In 1920 the mission was relocated to 1732 Buchanan Street where it remained until 1942. The mission was damaged by fire on three occasions: 1906, 1926, and 1931. Because of these fires, many records of the mission were destroyed, which accounts for the imprecise account of its early history. The list of clergy serving the mission is a long and distinguished one. After the Rev.Tai, the Rev. Kumazo Mikami served from 1896 to 1899. The Rev. Daijiro Yoshimura was next, and in 1901, Mis Mary Patterson, a former missionary in Nagano Prefecture returned to the US and provided valuable assistance to the mission. Christ Church influenced several of its young members to enter the Episcopal ministry. Some of them went on to establish missions or to take over churches in other areas, the church thus becoming known as the mother church of the other Japanese Episcopal churches in the US. 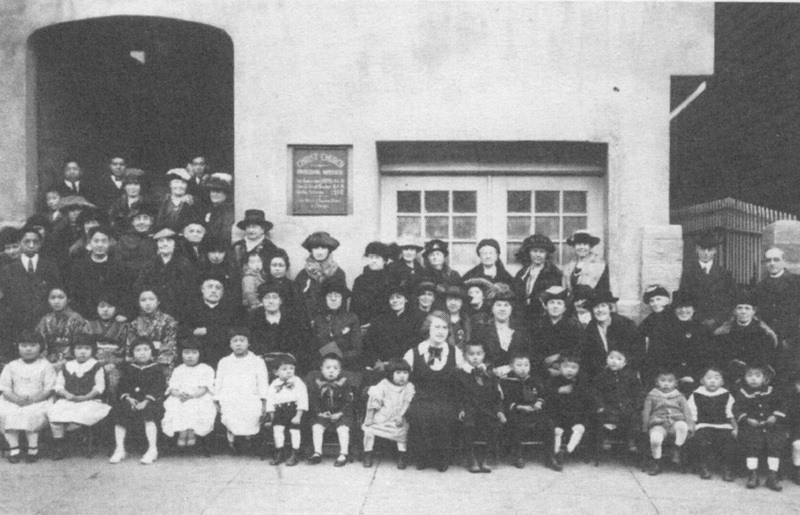 One of these students was John Misao Yamazaki, who founded St. Mary’s Church in Los Angeles. His son, Rev. Canon John Yamazaki, is the rector emeritus of that church. In 1903, the Rev Paul Shigemitsu Saito was appointed minister of the mission. He was a graduate of the Episcopal Seminary in Tokyo. He also studied at the Seminary in San Mateo, the predecessor to CDSP in Berkeley. The next minister for the mission was the Rev. Peter Aoki, who left in 1909 to accept an appointment to a new Japanese mission in Oakland. The Rev. Light Shinjiro Maekawa, a graduate of Keio University and student of the Seminary in San Mateo was next. In 1913, he returned to Japan and later became the Bishop of South Kanto. The Rev. Paul Murakami, another graduate of CDSP and a deacon, was appointed to the mission. In 1915, there were nearly 25 communicants and about 20 children in Sunday school. Rev. Murakami returned to Japan in 1917, and the work of Christ Church was carried on by the staff of Grace Cathedral. Mr. Reisaku Ito, a candidate for Holy Orders, assumed charge of the mission as a lay reader. He was ordained Deacon on October 20, 1918. He returned to Tokyo for further study at St Paul’s University in 1920. After several other clergy had come and gone, Joseph Kenjiro Tsukamoto went to CDSP and General Theological in NY, and was ordained first deacon and then priest. He eventually was appointed priest in charge. Mr. Hisayoshi Terasawa assisted him. Between the two World Wars, the church grew to about 150 members. Services in English were added, a Sunday school was established, along with a choir, altar guild and women’s auxiliary. A Girl’s Friendly Society was formed as well as a Young People’s Fellowship. During WWII, most of the congregation was interned in Topaz, UT, some in other camps. Rev. Tsukamoto and (now) Rev. Terasawa carried on the ministry with their members in the camp. It was a huge shock to the church. At the end of the war, many members had moved to other parts of the country, but a nucleus of strong supporters convinced the Bishop to reopen Christ Church. Rev. Tsukamoto and his wife Jane sought out not only English speaking prospects, but also new arrivals from Japan and Hawaii, inviting them in, feeding and occasionally housing them in their own little vicarage! 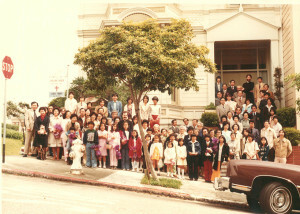 In 1952, the church relocated from Japantown to its current location at Pierce and Clay at the urging of Bishop Block. In 1958, Rev. Tsukamoto accepted a call from the Diocese of Los Angeles to be the Missionary-at-Large for Japanese work in LA. Rev. James Saburo Nakamura came from Honolulu to take his place. Recent clergy at Sei Ko Kai have been the Rev. Ted Thompson, the Rev. Richard Helmer, the Rev. Penelope Duckworth, and currently the Rev. Stina Pope.